Go Figure! Often said when something is amazing and Incredible! 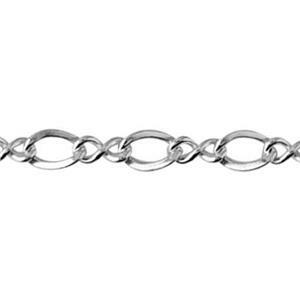 The 219C8 – Bright, Sterling Silver 2.3mm Figure 8 Chain is both. One of the prettiest bulk chains we carry. Little delicate figure 8 wire twists that join the larger links together into one delightful chain. Figure on it becoming one of your bulk jewelry chain best sellers also! Looking for it in Yellow Gold-Filled? See Our Gold-Filled 2.1mm Figure 8 Chain. This delicate chain is simple, yet eye catching. I have used it with my new jewelry line and it looks stunning!